My love of BBQ started when I was a child, helping my Dad in the back garden, regularly cremating the outsides of sausages and burgers during family get togethers. Once I started driving, I joined a local Mini Owners Club, and used to help out at events, and would also, in the later years there, take along my BBQ and cook for the members during the events. Then came married life, and the barbecues continued, but the amount of people catered for got bigger. This was due to us decorating our house for Christmas, for charity, with thousands of lights, and would always have a Switch on night, complete with a BBQ with donations for the food going towards the chosen charity. One of the last times this happened over 100 people turned up for the night, and we managed to feed them all, plus raised alot of money in the process. BBQ is for ALL year!! 365!!!! 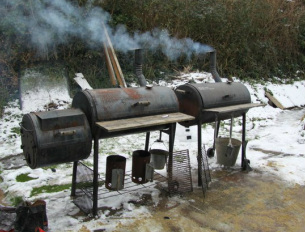 Since the earlier days of 'open' charcoal grills, I have now moved on to the closed 'smoker' style barbecues. We have various parties throughout the year and are even considering going into Barbecue Competitions!! We didn't know about these until we started looking into smoking and grilling more! Over the last year, I got together with my girlfriend, Sarah, and until then she hadn't heard about this style of BBQ food either. Since tasting some of the pork I cooked one weekend, she is now also hooked. So, Sarah helps in preparing the meat with rubs and marinade injection, and also doing some of the cooking too. Well, there's a little introduction to us. We hope you enjoy browsing our site. Please feel free to ask questions, either in the Blog, or via our comments/enquiries tab, and we will do our best to help! Thanks again, Glenn and Sarah!